A amplifier of acoustic frequencies can be manufactured with discernible materials, despite is known so much the difficulties of finding of materials, what the problem of regulations. These difficulties are overcome relatively easily if we find amplifier in form completed. Completed STK465 is an amplifier of acoustic frequencies that offers qualitative output, using minimal exterior elements. Substantially he is one of big completed force. Has a line pins and incorporated metal surface for adaptation in cooler. The provision pins in a line, facilitates the placement completed in the end printed and his support in cooler. The circuit functions in a big range of benefits of catering, from 20V as 60V, and it attributes 30WRMS, when the tendency of catering is above 50V and composer resistance of loudspeaker is the 4 or 8 Ohm. The catering should be symmetrically. When it functions with tendency 56V then the tendency will be � 28V as for the ground. With this recommended tendency of catering, the attributed force is 30 WRMS in charge 8W. The price of deformity is acceptable and oscillates around in the 0,08% for force of expense from 1W until 30W. Curve response his it is extended from 10Hz and reaches 100 KHz, with divergence 0dB and -3dB respectively, measured in force 1W. 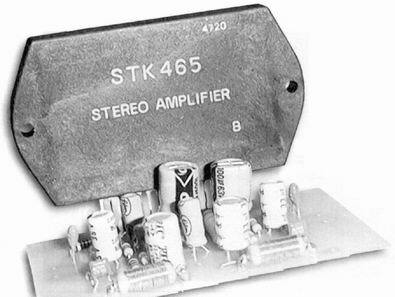 Using evolved techniques, completed amplifier STK465, can minimise the deformities even in highest levels of force. Other characteristically that determines the completed circuit they are: the wide area and the high aid. STK465 is drawn to be constant, when it functions in conjunction closed bronchi with big gain. As all the amplifiers, thus and this, under certain unfavourable conditions, can turn in oscillations. These oscillations have as result of returning in the same phase from the exit in the entry, or from bad designing PCB, or from bad choice of corridors in the circuits of entry. 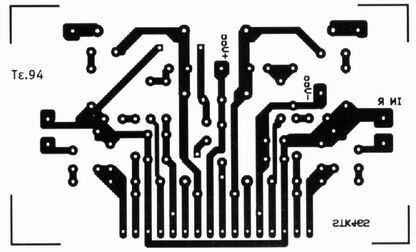 When you draw a printed circuit, it is important to return the current of charge and the current of signal of entry in the ground, via different corridors. Generally, positive is the charge it is connected directly in pin the catering and in particular in common pin electrolytic the catering. If entry and charge are connected directly in the 0V via the same road, then are created retroactions, what have as consequence oscillations and the deformity. To you we propose maintaining as much as possible smaller the cables of ground 0V and the capacitors of unharnessing, so that are limited the results of self-induction and resistance of lines of copper PCB. Sometimes the oscillation is owed in big length drivers between entry and expense, particularly if these have big length and the complex resistance of source are high. Can anticipate the oscillation that is owed in long wirings, adding capacitor from 50 - 500pf between pins entry. For the low deformity, important role plays also the placement of conductors of catering. This should be kept as much as possible more far from the wiring of entry, so that is deterred thus the not linear catering in the entry of IC. STK 465 does not have system of thermal protection, so that are avoided the thermal elations. If the temperature of JC reaches in high price, then the amplifier changes the polarisation of rung of expense. If the temperature is increased, then in order to is ensured the operation it should you grow cooler. 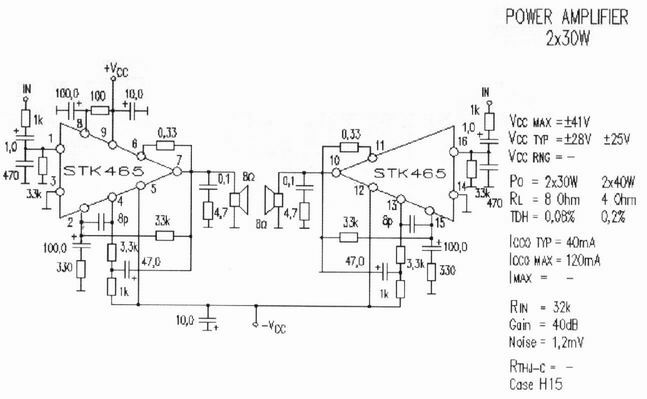 The amplifier functions with catering of double polarity. 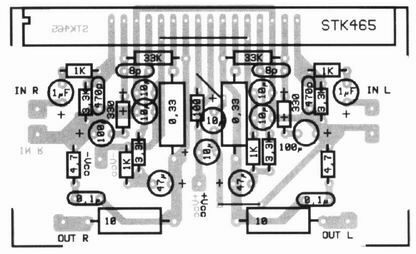 In form 1 we see the electronic circuit of amplifier that Is based on the STK 465. The circuit is stereo and has two channels of amplifier in a nutshell. It is a formal designing that develops positively all the particularities completing. Concretely, we observe that the not inverting entry completed (pins 2 and 15, for each channel), is supplied from divider of tendency, which ensures tendency from the tendency of expense completing. At the same time with the entry in each channel, exists a capacitor 470rF, which achieves the unharnessing, in that it concerns the AC components of high frequency, while en line a capacitor 1mF allows in the amplifier to be supplied from desirable flourish acoustic frequencies, fence simultaneous the continuous component. Bronchi unharnessing it is realised with the help of networking of two resistances 33KW and 330W and a capacitor 100mF, which finally ensures factor of aid equal with 100. Finally, at the same time with the exit exists networking RC (0,1mF - 4,7 Ohm) that it attends to the minimisation of phenomenon crossover. The amplifier can be supplied from a line of double polarity. Still it can function under a wide region of tendencies (�10V as �28V). The requirements of current depend from the force of expense and it can they begin from 120mA up to 1A. It is very important the catering to be sufficiently unharnessing, so that is avoided imports of annoying noises. For the realisation of manufacture you are consulted the forms 2 and 3 that portray the PCB and placement of materials in this. Does not exist a dangerous element in the manufacture that it should him you are careful particularly, so much at the soldering, what at the use. Be careful the electrolytic capacitors, the placement cooler completed and naturally the polarity of lines of catering. One still directive in what it concerns the catering: good it is it is used power supply with big capacitors standardisation or still better stabilised.